"Microsoft will soon release a new mobile OS for embedded and enterprise devices based on Windows Mobile 6.5, to be followed by an enterprise-focused version of Windows Phone 7 in 2011, Microsoft chief executive Steve Ballmer said by video at the launch of a new Motorola enterprise smartphone on Thursday." Wow...this came out of nowhere! Last year there were rumblings about there being two versions of Windows Phone 7 - one consumer-focused, one enterprise-focused - but it never materialized when Microsoft officially announced Windows Phone 7. Now it seems we know why: the enterprise version based on Windows Phone 7 won't be ready until the second half of 2011. Instead, within the next six months, Microsoft will release Windows Embedded Handheld, which is based on Windows Mobile 6.5. 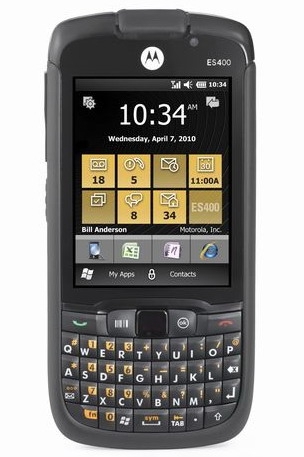 The announcement comes at the launch of the Motorola ES400 - pictures above - which is a Windows Mobile 6.5.3-based handheld device sold through Sprint's Enterprise channels. If it looks somewhat familiar, it's because it was designed by Motorola's Enterprise Group...previously known as Symbol. Remember them? They made some pretty cool ruggedized devices. The ES400 is powered by a 600 Mhz ARM11 processor, supports Sprint's CDMA EVDO and GSM HSPA, along with 802.11a/b/g Wi-Fi. A fingerprint reader on the back and a barcode scanner - along with a ruggedized keyboard - round out the enterprise-class hardware. The screen is 3-inches, with a 640 x 480 resolution. The ES400 will launch later this year - no price has been announced. They have done a lot to make the 6.5.3 interface appear Windows Phone 7ish. Don't see this as doing much until the 7 version is out next year. I think MS frequents thoughtsmedia.com. First a Zune like UI and now a "professional version". I hope it brings back a lot of whats missing. But I fear that they have built such a big wall around the current implementation of Windows Phone 7, that they won't be able to undo it for a professional version. Everything else being equal, who'd buy the phone with more limitations when presented with an option? Well..... while this "announcement" came unexpected it wa an obvious one: who could seriously believe that mid and big corporations would have allowed employees to install Zune software on their desktops to sync with WP7? Not be able to install apps using cabs etc.? What I hope, not just as an user but as a MS shareholder, is that when they will finally have WP7.XXXX ready the OS will boot and ask users what they want to do: do you want to install "social networks" ability? Do you want to use XBox games? If so your phone will "call home" any time it boots; etc. etc. .
Enterprise edition, hmmm? Let me see. Any bets that it will include some "enterprise friendly" concepts like access to extra storage, database functions, and maybe even cut-and-paste and multi-tasking? Sadly, that would be expecting a lot at this point.